Survey: What Can We Expect From the Trump-Putin Summit? 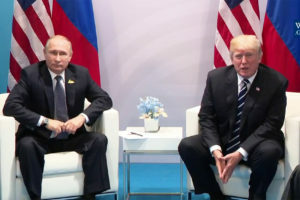 On July 16 U.S. President Donald Trump is due to meet his Russian counterpart, Vladimir Putin, in Helsinki for their first official bilateral summit. Russia Matters has asked eight experts to weigh in on the meeting’s prospects. All agreed that improving U.S.-Russian relations would be a slow process that would take patient work. Among recurring themes, several respondents pointed out the need to restore “basic and necessary contacts on multiple levels”-particularly military-to-military channels, high-level contacts and intelligence liaisons-and identified arms control as perhaps the most immediate area in which progress can be made. For their full answers to our three questions-on the possibility of a grand bargain, less ambitious goals for U.S. Russia policy and the shortest path to normalizing relations-read below. 1. Some U.S. officials, past and present, as well as other Russia watchers, argue that a grand bargain between U.S. President Donald Trump and Russia’s Vladimir Putin at their first official summit is unlikely. Do you agree and why? The planned July 16 Trump-Putin summit will take place amid the most dangerous and confrontational U.S. Russia relationship since the early 1980s. Hostile rhetoric and mutual demonization, frequent “near miss” incidents between military forces and the collapse of traditional arms control and conventional security agreements all attest to the risks for both sides and the wider world. Some of the toughest challenges have to do with domestic politics. President Trump faces the ongoing Justice Department “Russia investigation” led by Special Counsel Robert Mueller, while partisan attacks invoking Russia are at a fever pitch ahead of November’s mid-term elections, and leaders from both parties are warning about the risks of further “Russian meddling,” setting the stage for what could be another bitterly divisive vote, whatever the outcome. On the Russian side, years of relentless anti-American propaganda has borne fruit, and the public is hardly ready to see its leaders offer even the barest of concessions to Washington. Russian national pride has come to embrace and even revel in the U.S.-led attempts to exclude and isolate Russia from the international system and to punish it economically. In such an atmosphere, any expectation of major progress-a “grand bargain” between the sides-would be pure fantasy. Neither side has the will or the capacity to deliver the building blocks for such a deal, since it would require changes in policy positions viewed as fundamental by a wide range of political stakeholders in both capitals. On the U.S. side, the White House is constrained by hawkish Congressional opinion, and even legislation blocking any major changes in sanctions policy. Thus the idea that Trump could ease sanctions against Russian state entities and prominent individuals without major concessions on the issues that provoked them is far-fetched at best. A grand bargain when presidents Trump and Putin meet in Helsinki is unlikely, and that is probably a good thing. It is difficult to see a big trade-off between different issues-some have suggested Syria and Ukraine-that would be both plausible and in the U.S. interest. A grand bargain between Russia and the United States at this summit is highly unlikely. First, Moscow and Washington continue to disagree on key fundamentals of global security. Second, however inclined Donald Trump may be to deals with Vladimir Putin, he is constrained by Congress, the public and, indeed, much of his own administration from trading away, for instance, U.S. support for Ukraine. This is precisely the sort of thing the CAATSA legislation was meant to prevent. President Trump’s leadership style favors trying to strike a grand bargain, but it would be a mistake to shoot high in this initial summit meeting between the two leaders. Bilateral relations are in the worst state since the end of the Cold War. Moreover, U.S.-Russian relations have been deteriorating for years. Channels of communication have been cut back. The lack of dialogue has gotten so bad that each side no longer has an understanding of the positions and concerns of the other. A zero-sum-game mentality prevails in both camps. Our respective national interests diverge on key issues, e.g., the strategic nuclear balance, NATO enlargement, Ukraine, cyber meddling, Syria, etc. Wielding a magic wand is no substitute for rolling up our sleeves and establishing a step-by-step process to rebuild confidence and restore the level of trust that is necessary for addressing serious disagreements on principle. I don’t know what a “grand bargain” would be, so am not in a position to judge whether one is possible or not. Certainly one meeting cannot solve all the serious problems in the relationship and it would be absurd to set that goal or expectation for the Trump-Putin meeting. The most useful thing the meeting can accomplish would be to establish that, in the opinion of the two presidents, there is no valid reason for their countries to consider the other an enemy and there are compelling reasons to cooperate to deal with threats to both. It would be useful for the presidents to reiterate the pledge that Reagan and Gorbachev made in their first summit: that “a nuclear war cannot be won and must never be fought,” which means there can be no war between us. Yes, a grand bargain is unlikely because Donald Trump has very little maneuvering room to be able to offer inducements for Russia to compromise. He has almost no leverage on sanctions and faces a near unanimous consensus in Congress that concessions cannot be offered to Moscow as long as Russia continues its activities in Ukraine and Syria and denies responsibility for the 2016 election interference. There is no easy fix to U.S.-Russian relations, no grand bargain that will resolve the many disputes and no magic that will turn the upcoming summit between presidents Trump and Putin into the dawn of a new era of cooperation. The differences over the principles of world order, the resolution of geopolitical conflicts and the values that inform domestic politics are too profound for it to be otherwise. Moreover, even good personal chemistry between Trump and Putin will not change the equation. At most it can provide space for expanded talks between Russian and American officials but it alone cannot overcome opposing national interests. I agree that a grand bargain is unlikely for a number of reasons. There is too much domestic opposition in the U.S. to any agreement Trump might make with Moscow and Congress gets to have its say on a lot of issues. Second, it is clear that the administration is itself divided on a host of issues pertaining directly to Russia and on issues where Russia figures in the discussion, e.g. Korea. Third, Trump himself is clearly ignorant of many of the details that would have to be agreed to and any agreements would provoke an explosion within NATO, as well as within the administration and Congress. Fourth, he also clearly is unable to forge a consensus as to what we want from Russia and it’s doubtful that he truly knows what he wants or the tradeoffs among issues needed to make it work. Thus Trump’s failings as president, while they make us all anxious, also, I believe, work to frustrate any idea of a grand bargain. And in any case, Putin is not prepared to give up anything. And though he may be offered reduced sanctions to eject Iran from Syria he cannot for the reasons offered below. 2. If no grand bargain can be struck, is there any relatively low-hanging fruit for Trump to “pick” at the meeting and, if so, what could it be? The summit’s primary deliverable is likely to be the fact of the meeting itself. At a time when contacts between the two governments have been all but frozen, this is indeed significant. By meeting and setting a pragmatic tone, even if they underscore disagreements on a wide range of issues, the two presidents can give their respective bureaucracies the impulse and the political space needed to restart basic and necessary contacts on multiple levels. The point of these contacts is not to implement summit-level decisions solving outstanding problems, but rather to rebuild the infrastructure on both sides for understanding what is at stake in the current conflict, communicating clearly and regularly and, above all, controlling risks of unwanted escalation. One deliverable that the summit could produce is agreement to extend the New Strategic Arms Reduction Treaty. Moscow has expressed interest, and the U.S. military leadership would approve. But Mr. Trump has expressed skepticism about New START in the past. While New START extension would be a useful summit outcome, it may not be enough by itself to put the broader relationship on a more positive trajectory. Energize the U.S.-Russia dialogue in support of the Minsk process to bring genuine peace to, and restore Ukrainian sovereignty over, the Donbas. Each of these dialogues would need time to yield fruit. Still, Helsinki could, with a push from the top, usefully set them in motion. It is difficult to see any meeting of minds on the elephant that will be in the room-Russian interference in U.S. domestic politics. Mr. Trump should simply put down a marker that such interference is unacceptable and will result in a U.S. response. One qualifier to all of this: with Mr. Trump, there is always a large unpredictability factor. The absence of a grand bargain does not, however, mean the summit cannot be useful and lay the groundwork for better mutual understanding and a path out of the spiral in tensions. A successful summit could, first and foremost, deliver extension of the New START agreement. This would not only be in and of itself good for both sides, but would also signal continuing interest in arms control, which the two countries need but lately seem on the verge of jettisoning. Relatedly and for much the same reasons, Russia and the U.S. would both benefit if the two presidents agreed to get their experts talking about the future of the INF treaty. Finally, a commitment to resume and develop military-to-military ties can be crucial for avoiding missteps and crises. This is not to say that the two cannot and should not talk about Ukraine and Syria. A firm plan to introduce international peacekeepers to Ukraine and a way forward for rebuilding Syria would both be wonderful to have. However, Trump and Putin cannot deliver either without the acquiescence of many other parties, however much they may want to decide for them. This first summit meeting will not be measured by any substantive achievements, but by the assertion of presidential top-down leadership that is required to drive the establishment of new processes and mechanisms for comprehensive negotiations. Working-level talks should take on all issues under an all-encompassing agenda, without preconditions. There are many more possibilities than “grand bargains” and “low-hanging fruit,” whatever those nebulous terms may mean. It would be a very important achievement if the meeting led to a more trusting relationship that would facilitate the solution of the problems that face us. Both sides will need to change some of their attitudes and some of their policies since both have contributed to the present mood of hostility. We need not a “reset” of the existing operating system but the installation of a new one. There is no low-hanging fruit to be picked or a single issue the resolution of which would normalize U.S.-Russian relations. What is needed is a strategic framework, based on some shared understanding of future global challenges and recognition of each other’s interests, within the contours of which disputes can be managed or ultimately resolved and cooperation fostered. Such a framework cannot be developed in the short time before the summit, let alone at the summit itself in conversations between two presidents. The best that can be hoped for in this regard is a clear instruction from the two presidents to their bureaucracies to commence serious work on a strategic framework. In parallel with work on a strategic framework, Russia and the United States should continue talks on Ukraine, broaden channels on Syria beyond deconfliction of military operations to discussion of political resolutions and regularize talks on strategic stability, to include the INF Treaty, the START agreement and cyber matters. In all cases, progress will be slow given the complexity of the issues and the deep distrust between Russia and the United States. But such talks should reduce the risk of misunderstandings that could lead to conflicts neither side desires. Many are writing that some deal over Syria is in the works concerning deconfliction zones and the withdrawal of U.S. troops in return for Putin forcing Iran out of Syria in exchange for the reduction or termination of sanctions. I don’t think this is possible or a good idea. First, the Russians have already said they will not do it and more importantly they lack the power to force Iran out of Syria, a vital interest for Tehran. In addition, Bashar Assad falls if Iran goes and Moscow won’t let that happen. Second, the Russians have won in Syria, but they will not be left alone with Assad and the opposition and antagonize Iran to reduce sanctions they feel they don’t deserve, especially if they feel they can hold out longer and get the sanctions repealed at no cost. Third, Iran will resist and this could lead to a bigger or more long-lasting conflagration, putting Moscow in the eye of the hurricane, not where it wants to be. Separately, while arms control may not be low-hanging fruit, on no other issue is major agreement likely unless the two sides talk about reopening negotiations. That said, in light of violations by Moscow, the value of an arms control agreement to negotiate about outstanding issues or a new treaty is much less than the arms control community would have us believe. 3. If the resolution of a single issue could normalize the U.S.-Russian relationship, what would that issue be? By their very nature, summits cannot bear the main load for managing complex and difficult relations like those between Washington and Moscow. However, without meetings at the highest level, both governments quickly default into unhelpful patterns of stasis and even provocation. At a time like the present, allowing such strategic drift could present existential dangers to both countries and the wider world. For that reason if nothing else, the July 16 summit can be an important and necessary step forward. U.S.-Russia relations are in a deep hole, and moving that relationship to a better place-a desirable goal to be sure-will take time and patient work. There is no one issue on which progress would produce a normalization of relations. The Helsinki summit should instead aim at steps to prevent a further decline and to set up processes to untangle difficult problems. I think perhaps we have to accept that competition and disagreement between these two countries is, in fact, normal. The challenge lies in finding the right tools to manage this relationship, and mitigate its dangers, in a rapidly changing global environment. The greatest danger to both countries, indeed to the world, is the possibility of a nuclear confrontation between the two powers, or an escalating crisis that leads to war. Thus, the deterioration in the strategic nuclear balance should be addressed by restoring military-to-military channels of communication, increasing the frequency and quality of high-level contacts, and normalizing liaison cooperation between the special services (intelligence agencies). There is no single issue that is going to “normalize” U.S.-Russian relations. What is needed is a recognition that U.S.-Russian relations are not zero-sum games, that both sides have contributed to a deterioration in relations, and that this is in the interest of neither country. In fact, it is dangerous to the security of both. Trump and Putin need to acknowledge the current concern in the U.S. over Russian election “interference.” This could be done by a statement along these lines: “Both are concerned by the widespread conviction among the public in both countries that the other country has been guilty of interference in the political process in their country. Since it is important to avoid such suspicions in the future, the presidents will urge the leaders of the U.S. Congress and the Russian State Duma to organize a joint discussion of steps that can be taken to avoid such suspicions in the future.” Also, working out ways to improve relations will require some normalization of our diplomatic representation. This should be one of the first goals of the meeting. We will achieve little if we cannot restore some measure of civility to the relationship. Normalization cannot occur as long as Putin and Trump are respective presidents; normalization of the relationship can only occur in a post-Putin/post-Trump environment. As noted above, there is no single issue the resolution of which would normalize U.S.-Russian relations. In short, the Trump-Putin meeting could be the first step on the long road to the normalization of relations. Anything dramatic that might happen with the intent of improving relations quickly is more likely in the end to set them back than move them forward. There is no avoiding the hard work if the goal is more constructive relations. The single issue that could normalize relations would be coming clean on the information warfare against the U.S. in the recent presidential election, or maybe withdrawing from Ukraine on the basis of a negotiated settlement. But neither is likely.